These are not your mama’s lady fingers. No, not the delicate sponge cookies used to make fancy desserts like charlottes and tiramisu. 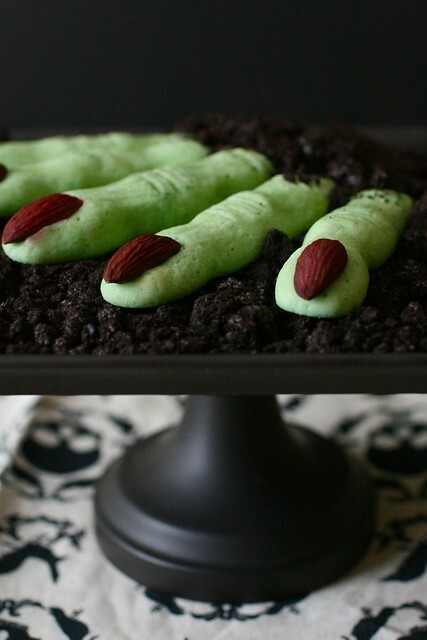 These are cookies that look like severed fingers. Gross, right? If you’ve never seen cookies like this before and are feeling completely repulsed right now, I’d say that’s about right. I first saw cookies like these about two or three years ago and was disgusted. But each year around Halloween I see them again, and I guess I’ve become desensitized or maybe a bit morbidly fascinated by the idea. In any case, this year was the year that I couldn’t resist finally attempting them. Plus, it only seems fitting after making eyeball cupcakes and brain cupcakes in the past. As far as the flavor of these goes, it’s just a basic sugar cookie – nothing spectacular. This is one of those times where I’m more focused on the effect and less on the taste. For a fun (creepy?) presentation, I threw some Oreos in a bag and coarsely crushed them up with my rolling pin. Then I spread the crumbs over the serving platter to look like dirt and positioned the fingers as though they were protruding from it. 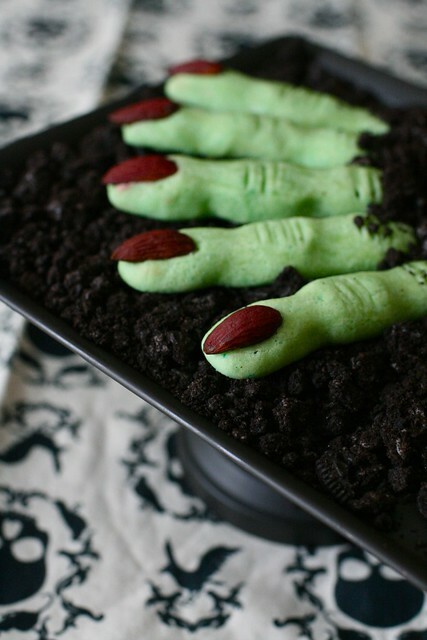 In a similar vein, you could serve a finger or two sticking out of the traditional dirt pudding set up instead of the usual gummy worms. Disgustingly delicious. Place the food coloring in a small bowl. Use a clean paintbrush to paint the food coloring onto one half of each almond. Set aside and let dry. In the bowl of an electric mixer, combine the butter and sugars and beat together on medium-high speed until light and fluffy, 1-2 minutes. Stir in the egg, egg yolk, almond extract, and salt and mix until incorporated. Mix in the flour on low speed just until combined. If desired, tint the dough with food coloring. Form the dough into a ball, cover with plastic wrap and refrigerate until firm, at least 1 hour. When you are ready to bake, preheat the oven to 350˚ F. Line baking sheets with silicone baking mats or parchment paper. Working with one half of the dough and keeping the other half chilled, divide into 16 equal pieces (a kitchen scale helps with this). On a lightly floured work surface, roll each piece into a finger shape about 4-4½ inches long. Pinch each piece of dough in two places to create knuckle shapes. Use the back of a small paring knife to lightly score the surface of the knuckles. Transfer the shaped fingers to the prepared baking sheets. Repeat with the second half of the dough. When all of the cookies are formed, lightly brush with egg white and place an almond nail at the end of each finger, pressing lightly to attach. Bake until set, about 12 minutes. Remove from the oven and let cool. If the cookies have spread or lost shape at all, reform them gently while they are still warm but cool enough to handle.